Think You Know ‘Free-Range’ and ‘Cage Free’ Chicken? Think Again. The world of industrial animal agriculture has progressed exponentially over the past 100 years. Today, meat consumption has become synonymous with being “American,” and many people do not consider a meal without some form of animal protein as being “complete.” But, despite the ubiquity of meat, eggs and dairy in the U.S. not many people understand how animals in the agriculture industry are raised, slaughtered and delivered to their local grocery stores. The reality of life for animals on factory farms is gruesome to say the least. Thousands of animals are kept in cramped, filthy conditions for the duration of their lives, many of whom reach the slaughterhouse too sick to even stand. In an effort to hide the reality of where the products we consume come from, the animal agriculture industry employs clever marketing techniques to convince consumers that the animal products they are purchasing are in some way “better” and “different” than your standard mass-produced ones. Rather than telling consumers their meat and eggs came from concentrated feeding operations where countless of animals were housed in cramped, unsanitary conditions – marketers capitalize on the “positive” and label these product as being fed and “all vegetarian diet.” This creates the illusion that animal welfare was actually given ample thought and consideration … making the consumer feel like they’re making and informed choice and picking a high-quality product. The same often occurs in the case of the “cage-free” and “free-range” label for chickens and eggs. Sadly, the difference between what this label implies and what it actually means, seems to have consumers incredibly confused. However, around 99.9 percent of chickens raised for meat in the United States are raised in factory farm conditions. So, rather than just having a few birds to keep track of, the typical factory farm “farmer” has around 20,000 to look after. Usually, these birds are confined to warehouses, where they may technically have access to a door that leads to designated outdoor area, but because of the mass crowding of birds – it is highly likely that many will never see the daylight during their extremely short lifetimes. In addition, chickens who are labeled “free-range” are also subjected to painful industry practices such as debeaking, which involves searing off the sensitive tip of the chicken’s beak without pain-killers. Where this label actually does hold weight is in the case of egg-laying hens. Most egg-laying hens raised in factory farms live in small battery cages that are shared with five to ten other hens, each is allotted a space the size of an iPad. This existence is incredibly stressful, not to mention highly unsanitary as the battery cages are often stacked one on top of the other. Battery hens can never spread their wings fully, a luxury that “cage-free” hens can enjoy. Now that you know the truth about what these labels mean, it is your duty to share truth. As consumers, it is our job to hold meat producers accountable for the claims they make and the best way to do that is by choosing not to support them. 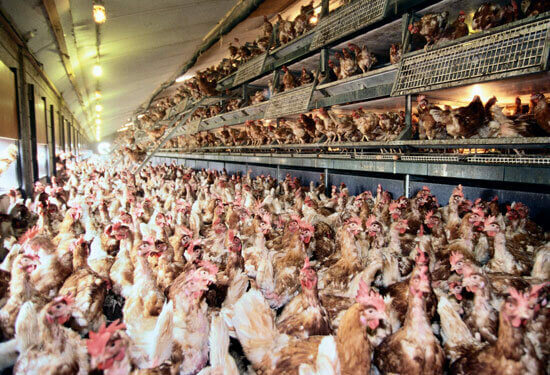 Chickens are highly intelligent, sentient beings and keeping them in these conditions is extremely cruel and inhumane. You might think that purchasing “free-range” or “cage-free” is the best choice you can make, but when you look at these images, does that really seem like the case? Thankfully, there are many chicken and egg substitutes are not only delicious, but free of all cruelty to animals. When you have an option that is truly better … why bother with anything else? Well sorry to inform the readers, but this article is not only EXTREMELY bisased but also not completely accurate. That is an example of "range free" (big difference) Yes, that is what cage free looks like. Caged birds are the cleanest barns. Range free and cage free barns are the worst health conditions for chickens. They are impossible to keep clean and are much dustier than caged barns. I know not everyone agrees with caged that is fine, but a farmers income depends on their animals. They are not going to purposely hurt their animals by either abusing or not giving them proper care. When they trim their beaks, it is not as painful as you make is sound. The heat helps prevent infection and it is about the pain as a piercing. (not as bad as it reads) This prevent chickens from killing each other. The term "pecking order" comes from this. Chickens are cannibals in nature, but if a farmer lets his chickens be natural he gets blamed, but doing all he can for the chickens, he also gets blamed. First off, you cannot possibly know how painful a beak trimming is to a bird as they have no way to communicate level of discomfort other than "comfort/discomfort". Secondly, yes a farmer has to make a living off of animals, but that is the entire center of the philosophical debate, isn\’t it? Cotton farmers had the exact same argument in defense of slavery, so is it a-ok to torture animals and then kill them by the millions because someone has a family to feed? And chickens aren\’t cannibals, you sock puppet. They compete for resources like all other animals, but their digestive tracts aren\’t designed for meat consumption… if anything, selective breeding might have resulted in greater aggression and unnatural behaviors (not to mention anyone would go nutters in the environment they are forced to live in).